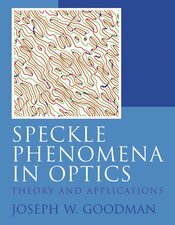 Speckle Phenomena in Optics provides a comprehensive discussion of the statistical properties of speckle, as well as detailed coverage of its role in applications. Some of the applications discussed include speckle in astronomy, speckle in the eye, speckle in projection displays, speckle in coherence tomography, speckle in lithography, speckle in waveguides (modal noise), speckle in optical radar detection, and speckle in metrology. This book was written for graduate students and professionals working in a wide variety of fields.